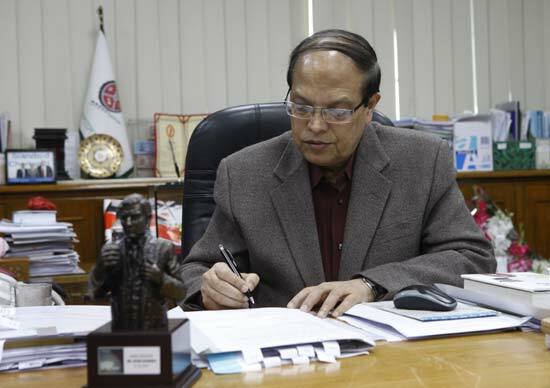 Dhaka, Bangladesh (BBN)- Former Bangladesh Bank (BB) governor Salehuddin Ahmed has expressed concern over slow growth rate and said it should be oriented towards productive and employment generating activities, which will benefit people. Dr. Ahmed, also professor of business school, BRAC University, said efforts to increase the growth rate should also aim at overall development of the society, according to ANI report. "Even if we do not have this eight percent, even if it is six or seven percent if that particular growth is oriented towards, it comes from productive activities and employment generating activities then I think even with this five to six percent growth rate it will be benefit the overall general people," the former BB chief noted. Unrest eased after the polls, which were boycotted by the main opposition party and shunned by international observers. But the respite could be short-lived as the opposition has said it will launch a fresh movement to try and topple the government. The government raised heavily subsidised electricity tariffs in March and plans to increase gas prices, which could push inflation still higher and add to public anger over the spiralling cost of living. Dr. Ahmed urged the government to emphasise on balanced growth and on the areas which were usually neglected. "Government should really emphasise on the employment generation, poverty alleviation, de-centralise development – a kind of balance growth in all over Bangladesh as your see that main of the areas of Bangladesh are still neglected," he suggested. The government had said it wants to trim inflation to seven percent in the current fiscal year ending in June. Stressing on investment in Bangladesh, Dr. Ahmed said the key sectors of the country are struggling due to poor investment.